This mini-retreat will provide an essential introduction to the science, study and meditations of Buddhist Tantra – the rich and deep practices of liberation developed in India and Tibet over one thousand years – which are extremely relevant in these complex modern times. ‘Tantra’ literally means ‘continuum of freedom-awareness’. By taking on the practice of the fruition of Awake Mind and Body as our path, Tantra cuts directly through the internal self-referencing stories which bind us to suffering states, offering a rapid path to freedom. By explaining modern psychological and physiological understandings of anxiety, fear and trauma as well as the remarkable plasticity and openness of our nervous system, Lama Mark will demystify how and why the Tantric path is so effective. Through teachings on refuge, bodhicitta and creation and completion stage practices, he will clarify the essential aspects of this path. 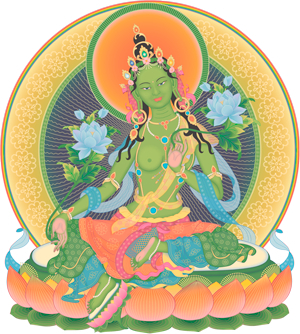 The retreat will conclude with the full tantric empowerment of the Twenty-one Taras (Tara – “to cross over”, “remover of terror”). This will open the door for those who wish to begin working with these practices. Building from the ‘Introduction to Tantra’ mini-retreat, over the remaining 18 days Lama Mark will deepen the exploration of the Tantric path by elaborating on the teachings and practices of the Twenty-one Taras. These powerful practices help us liberate from fears, anxieties and all kinds of obstructions, helping to build great emotional and mental strength. Through explanations, guided meditations and private practice we will learn to become each figure in the mandala, a process which causes different types of obstacles to be dissolved and strengths and talents opened up. This is a compassionate awake activity. Each figure is an aspect of the central figure of Green Tara. Around her are four different Taras representing the Four Buddha Activities of: peacefulness, unfoldment/increase, power, and fierce cutting through all obstacles. Then there are the remaining sixteen Taras that help remove deep seated fears and anxieties and bring about immense strength. This transmission of the Twenty-one Taras was revealed by the great 19th century Terton Chokgyur Dechen Lingpa, bestowed by the 16th Karmapa and Yogi Kelsang Rinpoche and was often bestowed and taught by Lama Mark’s main root teacher, the Ven. Namgyal Rinpoche. *These costs cover food and accommodation only. Please bring dana / donation for Lama Mark in appreciation of the teachings. Financial assistance may be available for those who couldn’t attend without. Please enquire if interested in applying.